Masse shots come in all shapes and sizes. Once your discover that you can elevate the cue, strike down on the cue ball, and create such a massive amount of spin, your creative mind will begin to wonder what exactly you are capable of doing with such a stroke. Recently, people who have bought the Eric Yow Masse Cue have shared with me that they “never knew these shots were possible” and are doing things they’ve “never dreamed they could do.” The creative pool player will begin to see shots that have never been seen, perform shots that have never been performed. I once read an author say that every pool shot that has ever been conceived has been shot before, implying that you will not be able to invent a new shot. I beg to differ. Several of my fans and friends have gone on to invent beautiful combinations, jump shots, and masse shots that I’m convinced are original to them. A few of them, I will shoot on ESPN Trick Shot Magic this Fall! An old favorite, however, is the substance of my article today. With my Yow! Masse Cue, I like to go back to the crowd-favorites like the Machine Gun Masse. In competition and in my exhibitions, I perform this shot regularly. Line up all of the balls as diagramed with the row of balls right at one ball’s width from the long rail. Strike down with your Yow! Masse Cue with straight draw-masse. I add just a touch of inside English (toward the rail) so that the cue ball hugs the rail a bit more, just in case it hops and tries to escape. 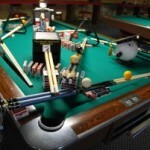 The cue ball will spin rapidly down the chute, making a noise like a machine gun, and pocket the all in the side pocket. If you have a clean ball and Simonis cloth, you can add more balls, perhaps from another set of balls. I’ve performed this shot on a 9 foot table taking the row of balls as far out towards the corner pocket as possible. Obviously, you must strike it harder but the effect is beautiful. 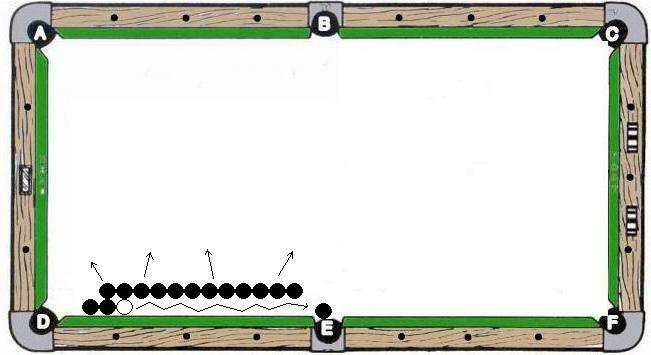 To add more flare, I have put a cue along the long rail and used three sets of balls, lining the row of balls one ball’s width from the cue stick. The cue ball will spin all the way down, hitting every ball, and be able to do so because it won’t lose its action due to the cue stick creating less friction than the rail would. Crowds love it!